Bring your four-legged friends to dog-friendly stores at The Shops at La Cantera! Looking for dog-friendly stores in San Antonio? 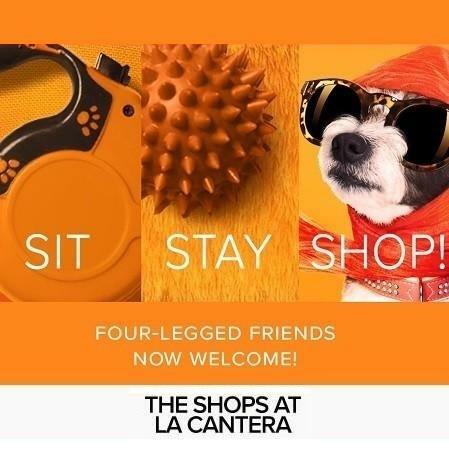 The Shops at La Cantera now allows dog owners to bring their well-behaved dogs to the common areas of the mall. Please check with each retailer whether or not dogs are allowed in their store or on the outdoor patio areas of restaurants. Our department stores - Dillards, Macy’s, Neiman Marcus, and Nordstrom – are all dog friendly. Additional dog friendly retailers include: A’ltard State, Abercrombie, Abercrombie Kids, Adore, Aldo, American Eagle/Aerie, Ann Taylor, Anthropologie, Apple, Athleta, Aveda, Bare Minerals, Bath & Body Works, Bella Nail Salon, Bevello, Brighton Collectibles, Brooks Brothers, Brookstone, Buckle, Cariloha Bamboo, Cellaris, Charlotte Russe, Clarks, Daniel Espinoza, Everything But Water, Finish Line, Foot Locker, Forever 21, Fossil, Francescas, Free People, GNC, H&M, Hanna Andersson, Hollister, House of Hoops, Hugo Boss, J.Crew, J Jill, Johnston & Murphy, Journeys, Kay Jewelers, Kendra Scott, L’Occitane, Lacoste, Lids, Lucky, Lululemon, LUSH, MAC, Madewell, Microsoft, New York & Co., NYX, Oakley, Origins, Pacsun, Pandora, Pink, Pottery Barn, Regis, Riley Rose, Robert Graham, Sephora, Soft Surroundings, Solstice, Soma Intimates, Sperry Top-Sider, Steve Madden, Stuart Weitzman, Sunglass Hut, Sunglass Hut II, Sur La Table, Swarovski, The Art of Shaving, T-Mobile, Tiffany & Co., Tommy Bahama, Toni & Guy, Tory Burch, Tory Sport, Tumi, Urban Outfitters, Vera Bradley, Victoria’s Secret, Vineyard Vines, White House Black Market, Z-Gallerie, Zales, Zara … and many more are being added each day! Bar Louie, Chick-Fil-A, Grimaldi’s Pizzeria, Kona Grill, Luciano Pizzeria and Palenque Grill. Please note that dogs are allowed on outdoor patio areas only.